Thor’s hammer necklaces – Thick silver Viking necklaces with either snake chains or king chains, which give you the opportunity to add a split ring and attach a Viking Thor’s hammer for that epic Viking necklace! King / Byzantine chains – Medium to thick silver Viking necklaces with Byzantine links and simple loop heads. Wear them on their own or add a Viking Thor’s hammer & split ring, or add a Viking pendant with a butterfly fitting, or buy a large pendant that will slot directly onto the chain. 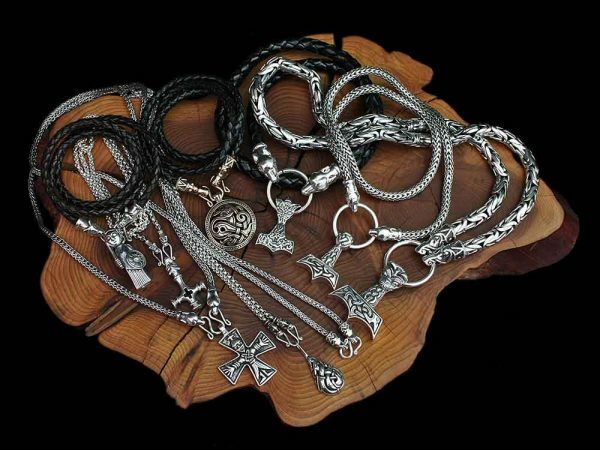 Slim Viking necklaces – Slimmer silver necklaces with either anchor links, snake chains, or king chain links. Wear them on their own, or with a silver Viking pendant. Braided leather Viking necklaces – Braided leather necklaces with a choice of either Gotlandic dragon, ferocious wolf, or Icelandic wolf heads in either bronze or sterling silver. Buy them on their own or with a Thor’s hammer or Viking pendant. Select your choice below to see what we have in stock, or request a custom length.